It has been almost a decade since I wrote a two-part article about water motion for “Aquarium Frontiers.” Newly offered products, along with Jake Adam’s series on water motion in Advanced Aquarist Online, prompted me to update these articles. This month, we’ll examine some of the newer water motion devices on the market. I won’t go into much detail on why water movement is important in reef aquaria since the subject is one of much review and discussion. However, we should (and most likely do) understand that it is acritical link in successful maintenance of many invertebrates. In lieu of such a discussion, we’ll look at the abilities of several devices in creating sufficient currents. Ingenuity is no stranger to the reef aquarium hobby, where ‘basement engineering’ has created products to fill niche gaps overlooked by large manufacturers. Some rather clever devices to create water motion have recently appeared on the market. Just how good are they, are their claims factual, and are they worth your hard-earned cash? An experienced marine hobbyists probably has a ‘bone yard’ of discarded equipment that failed to perform adequately, and it is little secret that marketing hyperbole within the hobby sometimes exists. This article will present objective performance evaluations of six water-moving devices, and can perhaps prevent your equipment graveyard from growing in size. All items, with the exception of the prototype Sea Flo kits, were obtained through normal retail channels, and all products were tested straight out of the box. 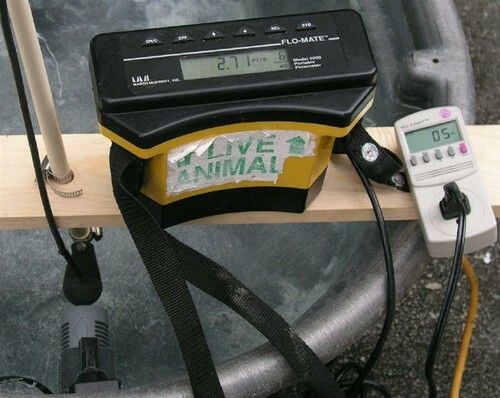 The discharge velocities of the modified powerheads were determined with an electronic water velocity meter (Marsh-McBirney FloMate 2000, see Figure 1). Output was calculated using the following formula: Flow = Velocity x Area, where Area is the size of the discharge (in square inches, using π*r² for round conduits) x Velocity (in inches per hour) ÷ 231 cubic inches per gallon = Flow, in gallons per hour (gph). A different method had to be used for determining pump rates with the stock powerheads. The powerhead to be tested was partially immersed in a container filled with water, and the discharge penetrated the wall of this container. Water filled the reservoir as water was pumped to a graduated cylinder. The time required to fill the cylinder was recorded. The flow had to be corrected for nominal flow through the pump due to positive head pressure. This was determined by using the same setup just described, but with the pump off. 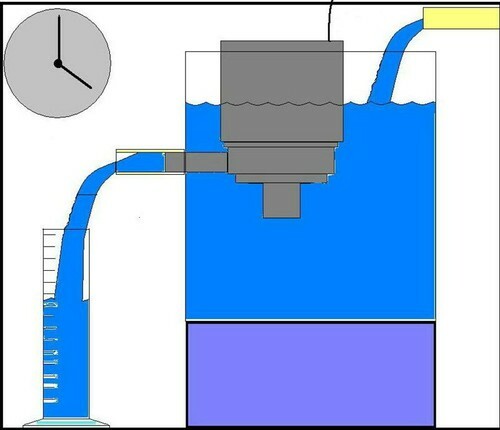 Volume due to positive head pressure was subtracted from the total amount of water pumped to arrive at an estimated flow rate (See Figure 2). In all cases, power consumption was monitored with a Kill-A-Watt electrical meter. Figure 1. The testing setup for estimating flow volume of high discharge pumps, using the electronic water velocity meter. Flow velocity is measured and then used to calculate volume pumped. Figure 2. The method used in determining small diameter discharge flows. Powerheads are small electric pumps that were originally designed to enhance the performance of undergravel filters. While undergravel filters have not found wide-spread acceptance among reef hobbyists, the powerhead is often the device of choice for creating water motion within ‘home’ aquaria. This month, we’ll examine three popular powerheads. In order to establish a baseline for Sea Flo’s modification kit available (and discussed later in this article), we will evaluate their performance straight out of the box. Maxi-Jet™ powerheads, manufactured by Aquarium Systems, Inc., have been available to hobbyists for years. They have a reputation for durability and their epoxy-encased motors are approved by Underwriter’s Laboratories. These features, combined with relatively low price, have made them favorites among hobbyists. Figure 3. The anatomy of a typical powerhead. There are design differences among the Maxi-Jet powerheads. Motor size is a major factor, with the 1200 (obviously) being the more powerful. Each pump has a specifically designed impeller. The volutes (impeller chambers) are the same for the 600, 900 and 1200 models. 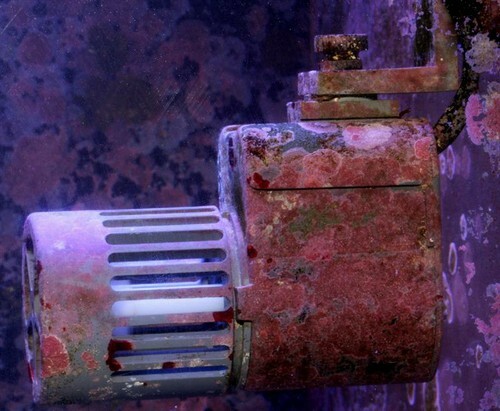 (The Sea Flo modification kit is not recommended for the Maxi-Jet 400, therefore this powerhead was not tested). The stock Maxi-Jet 600 used 6 watts and pumped 116 gallons per hour (using the setup shown in Figure 2). Testing, using the method shown in Figure 2, determined the Maxi-Jet 900’s flow rate to be ~198 gallons per hour. Power consumption is 7 watts under the conditions of testing. The Maxi-Jet 1200 powerhead is the most powerful pump in the Maxi-Jet series. Testing, using the method shown in Figure 2, determined the Maxi-Jet 1200’s flow rate to be ~230 gallons per hour. Power consumption is 17-18 watts under the conditions of testing. In these cases, modifying a Maxi-Jet powerhead involves replacing the standard impeller/volute assembly with a small propeller and large intake/discharge shroud. The shroud assembly will incorporate an important component – a propeller ‘stop’. 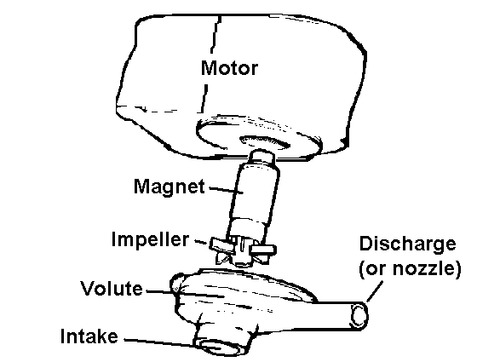 Since we’re dealing with a small alternating current (AC) drive motor that has the ability to ‘spin’ in two directions, the ‘stop’ will ensure that the motor/propeller rotates in the correct direction (the powerheads’ stock impellers do not care which way they turn – they will pump water while spinning in either direction). The principle for the ‘stop’ is simple – when the propeller spins the ‘wrong’ way, the propeller assembly moves forward, and the prop will make contact with the stop. Once the propeller’s motion is arrested, it will begin to spin the correct way. Stock impellers and volutes are generally not particularly efficient, and discharge sizes are small. On the other hand, a properly-sized propeller pump (the prop is designed to propel remote-control model boats) can move a lot of water. Figure 4. Exploded view of Sea Flo’s modification for Maxi-Jet powerheads. Sea Flo has offered modification kits for a couple of years, and has just introduced injection-molded shrouds to replace their older machined shrouds. Assembly is a simple as removing the shroud and impeller and replacing them with the Sea Flo propeller assembly and shroud – it is a snap. Assembly Time (first try): 5 seconds. Figure 5. The ‘original’ machined shroud, holder and prop assembly from Sea Flo. The newer version of the shroud is injection molded. Figure 6. The same Sea Flo-modified Maxi-Jet shown in Figure 4, but after a year of service. Using the protocol described earlier (and pictured in Figure 1) the Sea Flo-modified Maxi-Jet’s discharge velocity was measured at 3.51 feet per second. Using the area as mentioned above, this equates to 1,159 gallons per hour (gph). Power used was 14-15 watts. Figure 7. 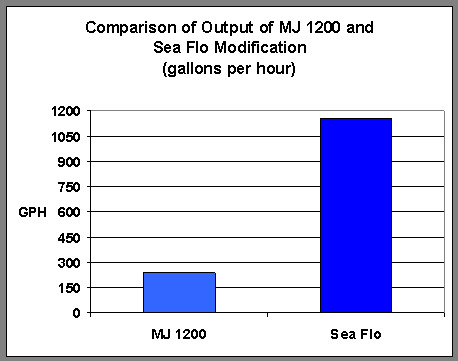 A comparison of water volume moved by a ‘stock’ and ‘Sea Flo modified’ Maxi-Jet 1200. Similar dramatic increases are also seen with the 600 and 900 mod kits. The modified Maxi-Jet 900 modified pushed water at a velocity of 2.5 to 2.75 feet per second at the discharge. This equates to a flow rate of about 763 gph. Power used by the modified 900 jumped between 5 – 6 watts. The modified Maxi-Jet 600 had a discharge velocity of ~2.4′ second. Flow rate was calculated to be ~666 gph. Power used by the modified 600 was 4 watts. Noise can be a problem with any aquarium appliance, especially if the tank is in a bedroom. Tolerances of the replacement parts are critical in order to avoid distracting or annoying vibration. Sea Flo’s replacement shroud has a snug fit. In addition, it utilizes the stock Maxi-Jet o-ring to dampen vibration. 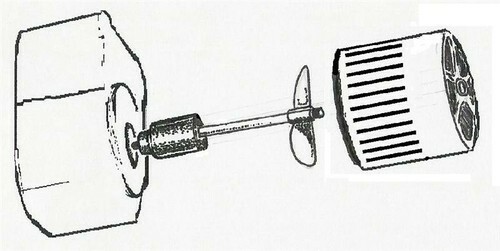 A second source of noise can be the contact of the propeller and counter-rotation ‘stop.’ In cheap or poorly-designed modifications, this noise is an irritating ‘rattling’ noise, sometimes lasting for several seconds until the prop begins spinning in the proper direction (this can also damage the propeller). Sea Flo’s design practically eliminates this source of noise. Another concern about noise is the potential for air intake within the propeller chamber which would result in a ‘slurping’ sound. The Sea Flo design incorporates a shield to lessen the chance of air intake (the Sea Flo logo on the shroud should be facing upwards). Size matters. I suspect most reef hobbyists want an aquarium full of fishes and corals and not bulky powerheads. The Sea Flo units are very good at creating water motion, so fewer pumps are needed. In addition, they are not much larger than the stock powerheads. If you find calcareous algae appealing as I do, these pumps can become covered with red and pink growths rather quickly and this goes a long ways in making the pumps blend in. The eloquent beauty of these kits is that they have avoided design of a new pump and have opted to offer a modification to an existing (yet inexpensive and practically bullet-proof) powerhead. Routine maintenance is easy, and is the same for any reef aquarium pump. The intakes on the shroud should be kept clear of fouling growths. Disassemble the pump and use an old toothbrush to clean the pieces of any bio-growths or calcium buildup (using vinegar if necessary to dissolve stubborn calcium ‘flakes’). The only part recommended for routine replacement is a small thrust washer (it is designed to wear out thus saving the major portion of the propeller assembly for continued use). These are available from Sea Flo for less than $1 each (in a pack of 3). Although the washer is small in size, it plays a very important role in keeping the motive assembly serviceable. Make sure the modification kit you purchase has this important component. We have used Sea Flo mods on wavemakers for over a year with no problems. The pumps and modification assemblies have suffered no failures, although very slight wear (scoring but not cracking) is seen on the propeller where it makes contact with the counter-rotation stop. Sea Flo mods come with a one year warranty. Note that Sea Flo will not warranty their devices if used on a wavemaker. As noted, we have experienced no catastrophic failures during one year of operation. Just as important, however, is the reliability of the assembly on start-up and that it operates in the proper direction quickly and without significant noise. Our 3 units have operated flawlessly. Power consumption actually drops when the Maxi-Jets are modified with the Sea Flo kits, and they move much more water. See Figure 8 for a comparison. Figure 8. Power usage of stock and modified powerheads. To our knowledge, Sea Flo offers their products only through their secure website. See: www.Sea Flo.com. Our experiences with Sea Flo have been very positive. Shipping is very prompt with orders arriving in less than a week. Based on our experiences with medium-sized stony coral aquaria, we recommend 1 Sea Flo modified powerhead for every 18 inches of aquarium length (with a minimum of two for aquaria exceeding 30 gallons). 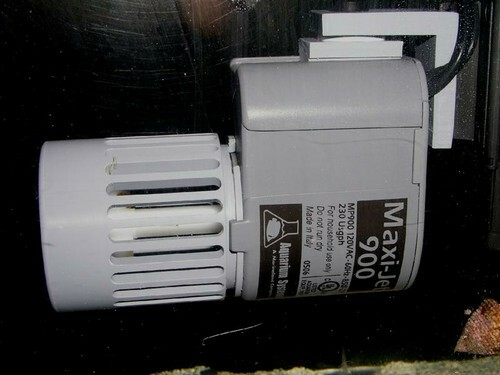 These modified pumps have applications for smaller reef aquaria, but we have not tested them on such. Be aware that two of these devices in a 40-gallon aquarium can move sand beds (even coarse sand) around (this is, of course, natural and is seen on real reefs even on calm days). Proceed cautiously – it is possible to ‘blow’ corals’ soft tissues off the skeleton if they are placed too close to a discharge. And while on this point – avoid the temptation to think more flow is always better. Soft coral tanks and fish-only aquaria could perhaps use fewer units. As always, standard safety precautions should be followed to guard against injury, (Marineland’s recommendations are listed on the inside front cover of the Maxi-Jet owner’s manual). There are several Maxi-Jet mods now available, as well as other pre-assembled propeller pumps (such as Koralia from Italy). I am in the process of testing these and can report varying degrees of success (or failures). If all goes well, I will report on those units that survived the testing period (6-8 months). 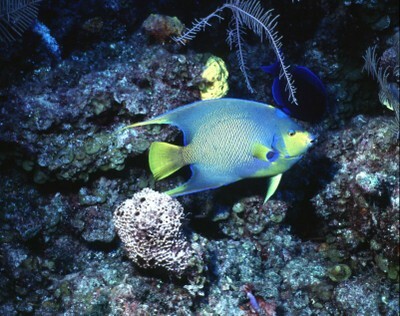 The Marine Aquarium Conference of North America (MACNA) will be hosted by the Atlanta Reef Club in September 2008. Don’t miss out on this great experience! See www.masna.org for details. Please contact me at RiddleLabs@aol.com if you have any questions. Many thanks to Joe Yaiullo of Atlantis Marine World (www.atlantismarineworld.com) for the link to Sea Flo.